Though the animated landscape has become more crowded since the days of Beauty and the Beast and The Lion King, musicals remain solid Disney turf. Their newest is Frozen, and while not quite on par with the classics, it still offers plenty to delight the entire family. Based on story elements from Hans Christian Andersen’s The Snow Queen, Frozen tells the tale of young Queen Elsa (Idina Menzel) and her sister, Princess Anna (Kristen Bell). The Queen has mysterious powers she struggles to control, and they have caused her kingdom to suffer under the ice and snow of a permanent winter. In sad desperation, Elsa has isolated herself in a faraway ice castle, which leads Anna, along with her friend Kristoff (Jonathan Groff) and a goofy snowman named Olaf (Josh Gad) on a quest to find the Queen and save the kingdom. 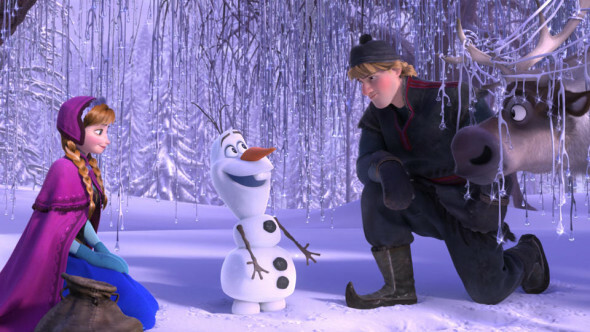 With its big-eyed princesses in peril, dashing gentlemen, wise-cracking sidekicks, and soaring odes to empowerment, Frozen feels instantly familiar. Beyond those Disney benchmarks, though, there is some irony in the casting of Menzel, who won a Tony award for originating the role of Elphaba in the stage musical Wicked. The similarity of the character names (Elsa, Elphaba), the unfair labeling of Elsa as “evil,” and the preeminence of a sisterly relationship over the search for Prince Charming all contribute toward a winning narrative assembled from some shrewdly familiar parts. Of course, none of these elements are above rehashing, especially in the land of fairy tales. Disney veterans Jennifer Lee and Chris Buck, sharing story and directing duties, weave them all into a fast-paced, funny adventure that will, if the audience at a recent preview screening was any indication, totally captivate the young ones. The 3D animation is often gorgeous, as the chilly setting gives the animators ample opportunity to impressively explore drifting show or glistening ice. Inside, Anna dances past framed paintings, a clever reminder of the added dimension these artists are deftly employing. Musically, the husband and wife team of Robert Lopez and Kristen Anderson-Lopez fill Frozen with original songs that are pleasing, if a bit unremarkable. While there’s no “Be Our Guest” or “Circle of Life” here, Menzel’s voice remains a wonder to behold no matter the material, and Bell, an accomplished singer in her own right, shows impressive versatility. Though he’s no match melodically, Gad steals the film as the daffy Olaf. Putting his unique voice to good use with some inspired delivery, he makes a funny character even more fun, and Frozen steps more lively whenever he’s near. Now, the big question: how are they going to recreate this frozen tundra for the theme park tie-in in Orlando?